Gah! How did this happen!? I used to be one of those people who started a project, finished it, and then moved on to another. 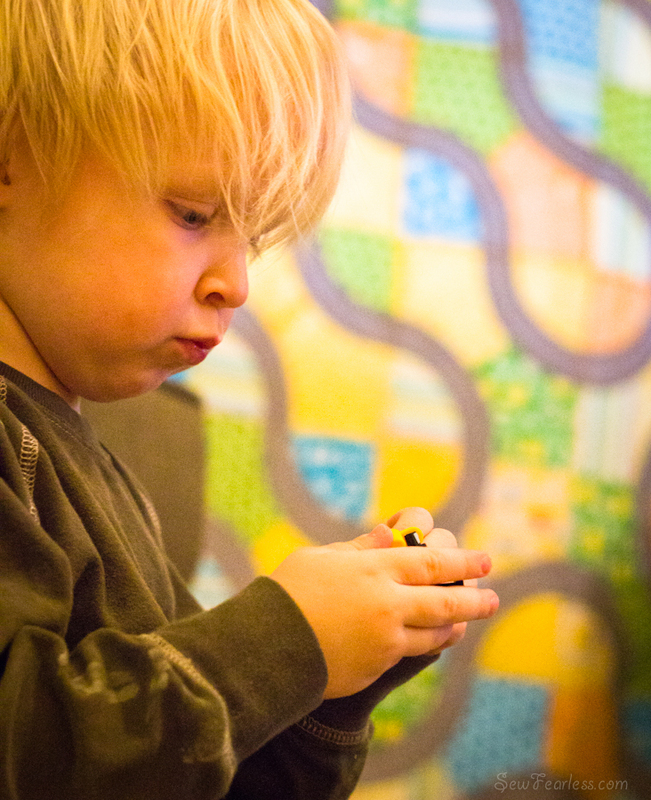 Now I have simultaneous projects up the wazoo, including Duncan’s Quilt. I last left you with completed blocks. After they were all pressed, and trimmed to size, I arranged them out on an old sheet. There is a very specific layout to the pieces to create the continuous “road” out of the blocks, and then I needed to avoided adjacent matches. It took time, but it was an enjoyable puzzle. 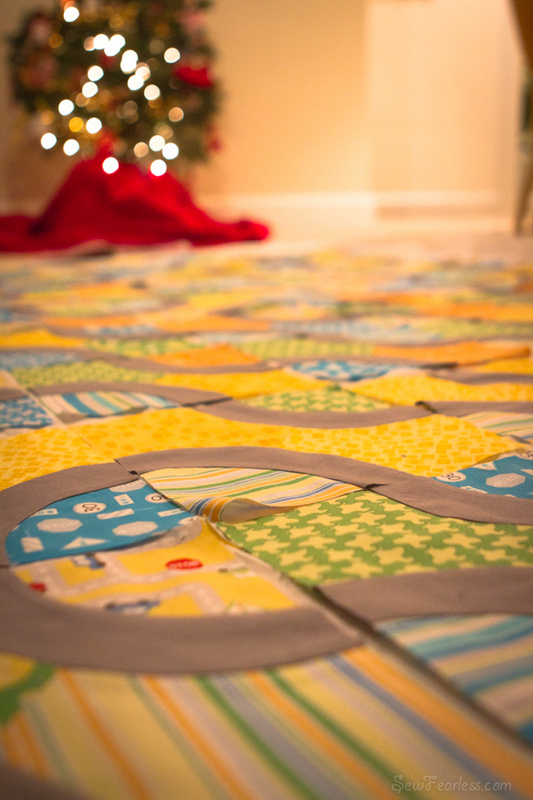 After I found my layout, I safety-pinned the blocks to the sheet. That way I could fold up the sheet and store it between sewing sessions. 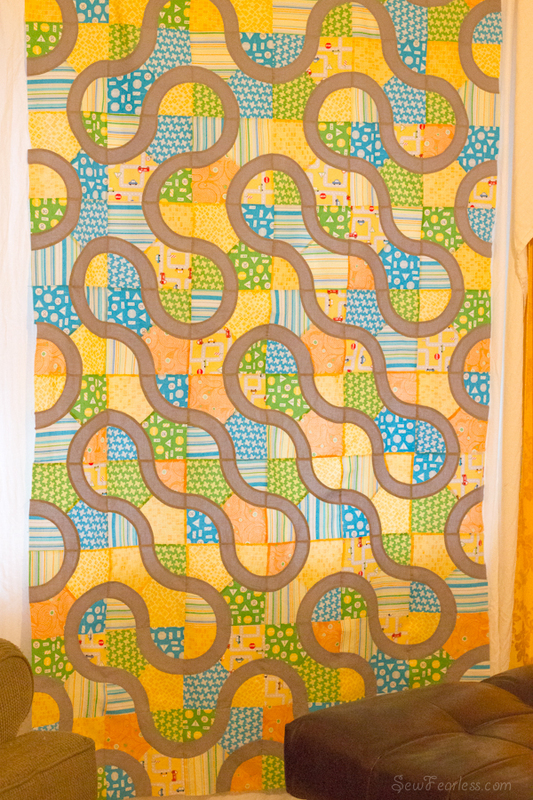 …until the quilt top was finished! this is AWESOME! I love it. Such a good idea with the sheet too… why have I never thought of that??? I cannot believe how awesome this quilt is! It is fantastic!!! And so boy-ish!!! Way to go! Oh my gosh it is amazing, I am so impressed by your accuracy and attention to detail. Very clever. 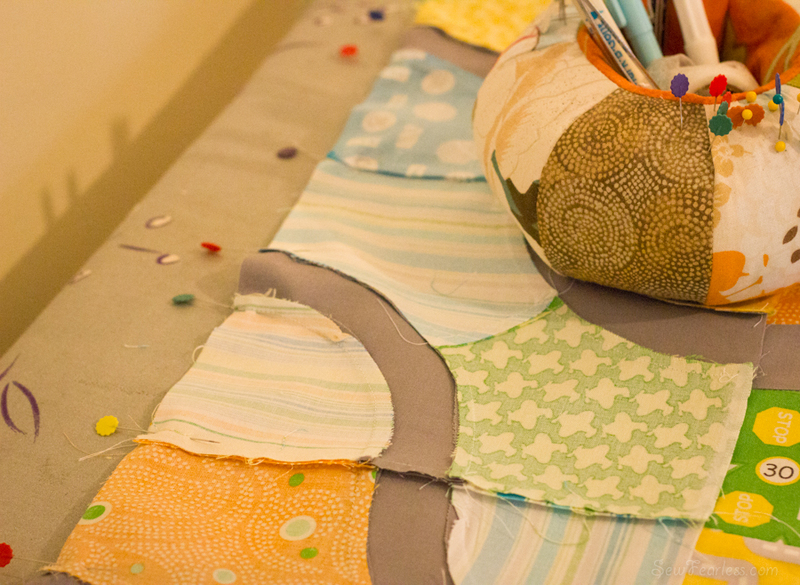 Pinning unsewn squares to a sheet — a what a great idea! Especially since I have nothing even approaching a design wall (I have a design floor, but only if I have swept and mopped it, and there are no Beadboys or Beadcats around). I love it! My brother and I drew roads like that on a bed sheet once. My mom was not very thrilled. 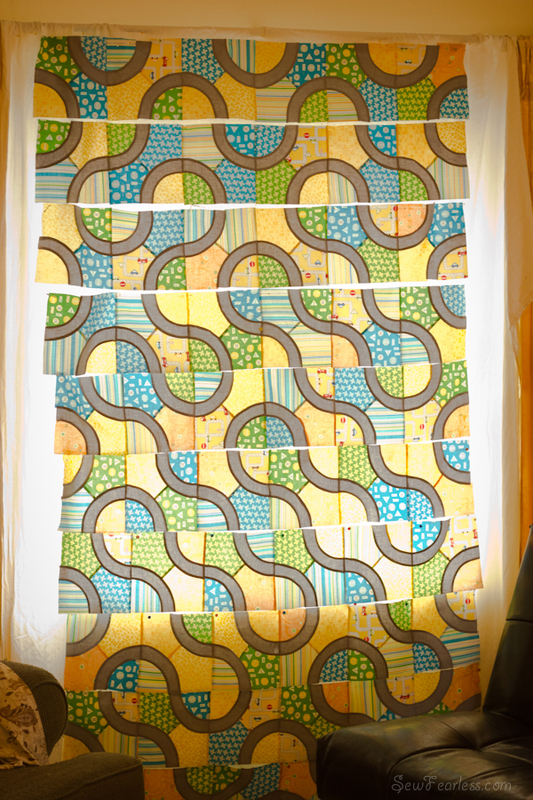 Now, had she made us a quilt like this, we wouldn’t have had to make a road-covered sheet for ourselves! Wow. It really looks like roads. I know a small boy who would have all his cars lined up on that in the blink of an eye. Your curves look great and match up brilliantly. I tried curves one time (a long time ago) and it didn’t come out too well so I’m not very keen to have another go! I have never been one to start and finish only one project at a time. If you’d like to teach me that skill, I’d love it. 😉 Your quilt is gorgeous! I can’t remember it has been so long. I want to say 8.5 inches including seam allowances?